NEW YORK — Despite rising home prices, more than 30 percent of borrowers, or close to 16 million homeowners, were underwater on their mortgage during the first quarter, according to Zillow. The percentage of borrowers who owed more on their home than it was worth increased to 31.4 percent during the quarter, up slightly from 31.1 percent three months earlier, according to Zillow. In the year-ago period, 32.4 percent of all borrowers had negative equity on their loan. The uptick in underwater homeowners occurred even though home prices have slowly started recovering. On Wednesday, the Federal Housing Finance Agency reported that national home prices rose a modest 0.6 percent during the first quarter, the first price gain since 2007. Nevertheless, the percentages of homeowners who were underwater on their homes remained high as delays in the processing of foreclosures kept many delinquent borrowers on the balance sheets, said Zillow. Once a bank repossesses a home, the mortgage holder’s negative equity is no longer considered part of the tally. Most underwater borrowers, however, do not lose their homes. 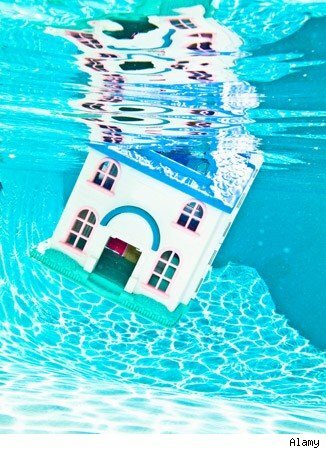 Nine out of 10 underwater borrowers are current on their mortgage payments and continue to make payments on time, Zillow said. Only one-tenth of these borrowers are seriously late on payments, by 90 days or more. Negative equity is still a big risk, however, since it makes homeowners more vulnerable to financial setbacks, such as a medical emergency, job loss or other unexpected expense. If they don’t have their home’s equity to fall back on, it increases their chances of spiraling down into foreclosure. Having a high percentage of underwater homeowners is also bad for the economy because it can trap borrowers in their homes and prevent them from pursuing employment opportunities elsewhere, according to Humphries. That can make it more difficult for them to advance their careers and for companies to find skilled workers. Where homeowners are struggling to stay afloat: Of the 30 large metro areas covered by the Zillow report, Las Vegas has, by far, the highest percentage of underwater borrowers at 71 percent. Home prices there are down a whopping 62 percent from peak, according to the S&P/Case-Shiller home price index. A quarter of Vegas borrowers owe more than double what their homes are worth. Other big markets where more than half of borrowers are underwater include Phoenix (55.5 percent), Atlanta (55.2 percent), Orlando, Fla. (53.8 percent), Riverside, Calif. (53.4 percent), and Sacramento, Calif. (51.2 percent). Cities with fewer foreclosures, including Pittsburgh, New York, Boston and San Jose, Calif., all had less than 25 percent of borrowers underwater.